Samsung's LE40B651 Series 6 LCD TV is gorgeous. The bezel around the screen has a distinctive crystal effect with a red tint. The remote control is large and cluttered but the onscreen interface is coherent. Connectivity is respectable: four HDMI inputs and two USB ports. One of these can be used with Samsung's £50 optional wireless 'dongle' if you are unable to plug in an Ethernet cable. 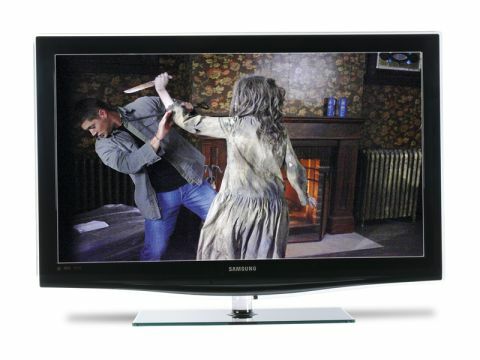 Samsung's term for net tellies is Internet@TV, available in many of its newer sets. It's a well laid out system, mostly populated with Yahoo! widgets for webmail, news and other information. A better fit for TV browsing is the Flickr photo-sharing site and a Twitter application. It stores one Twitter account but switching users means typing logins from scratch. Writing Twitter updates, even those under the 140-character limit, is slow, owing to the sluggish onscreen keyboard; mobile phone style via number keys would be better. For this reason Twitter on TV is fine for passive following rather than participation but it will not access weblinks in messages. Nor does the TV let you to browse the internet at large. Later this year YouTube joins the line-up. The media streaming feature streams MP3 and WMA music, JPEG pictures, MPEG4 and WMV movie files. It doesn't appear to handle DivX over the network but it plays directly from a USB thumb drive. The TV also has about 200MB of storage for preloaded content including pictures and miscellaneous information, which can be added to via USB. The best thing about the Samsung is the picture quality – after a bit of tweaking. You get the kind of control over judder and blur reduction that's missed on the Philips and Panasonic, which overcook the image when the processing is unleashed. HDTV and Blu-ray 1080p images are clear, with deep blacks that challenge plasma for impact. Its high-contrast performance is capable of going very bright, yet it's energy efficient, registering about 100W of use. Standard-def images can look pasty but, given the 40in screen, they are OK. Audio quality is customisable to an extent, but still a bit flat.